On Sunday after the show, Mary and I headed out to the barn on her way back to Chicago so she could pop Connor over some fences. - It's Mary. She's an incredible rider, especially over fences, and has one of the best analytical minds when it comes to horses that I've ever seen. I have heard so many trainers say "I'd put her on anything in my barn!" so many times. If any funny business was going on, not only would she identify it, she would quit right then if she felt it necessary. - He was tired after the show - and we've recently started to theorize that his shenanigans are related to having too much energy, both due to the type of hay he got switched to last winter, and his turnout situation (paddock instead of pasture). More on this later. - I put him in his loose ring. I knew she wouldn't need more, and I'm beginning to suspect the elevator is too much right now in general. Dat Samshield tho. She made a deal with a Samshield rep while she was still a CWD rep, otherwise she wouldn't have it. It's freakin gorgeous. 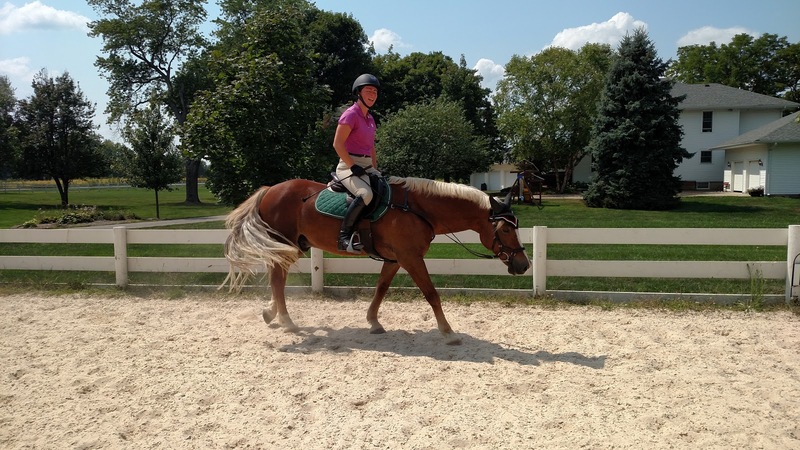 She started out with trot poles, and after the second time through, she pulled him up. "Did you see that??" she asked. "Yeah," I said, "He slowed down, lowered his nose, then lifted his back, engaged his hocks and went through with impulsion." "Yeah," she said, "But I think his problem is that he's just so worried about making it over. He's so careful - I mean, he never gets hurt even in turnout, right? That's just the default way he handles himself - careful. And he's so people-oriented, just look at how he loved being messed with at the show yesterday, he really cares about what's going to happen to both you and him on the other side. We have to teach him that it's always going to be okay." 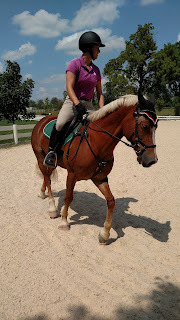 She moved on to canter poles both directions, and he struggled more to the right than left. When he was doing that reliably, it was poles between standards, then finally, a crossrail. Even after we raised the two fences into baby verticals, he stayed that quiet, jumped out of a rhythm, and generally looked bored out of his mind - which is AWESOME! She worked on helping him keep his chest elevated, theorizing that he's so comfortable now in a Dressagey canter (which she finally got to feel, and called it 'installed'! ), but he's not comfortable in a good canter to jump out of, with his throatlatch open and head up. He needs to learn to engage his hindquarters just as well in both types of canters. Here are some more clips, for the ADD folks in the crowd, they are no more than 10 seconds each. Mary had fun and Connor was good over fences. So many wins! He was! It was good to see. If you were closer, I would probably take you up on that. Temporarily, of course! Omg I just love him.. seriously could he be any cuter!! He looks great! And so cute, I always want to hug him when I see pictures/videos. He looks very huggable. I'm an ADD person who really appreciates 10 seconds clips. I think what she said about him being really careful/wanting you to get through it okay makes a lot of sense.